Draft: 2007, Cincinnati Reds, 3rd rd. November 6, 2017 1B Neftali Soto elected free agency. June 23, 2017 1B Neftali Soto assigned to Syracuse Chiefs from Harrisburg Senators. April 4, 2017 1B Neftali Soto assigned to Harrisburg Senators from Syracuse Chiefs. February 11, 2017 Washington Nationals invited non-roster 1B Neftali Soto to spring training. October 27, 2016 1B Neftali Soto assigned to Cangrejeros de Santurce. August 6, 2016 1B Neftali Soto assigned to Syracuse Chiefs from Harrisburg Senators. February 16, 2016 1B Neftali Soto assigned to Syracuse Chiefs. February 8, 2016 Washington Nationals signed free agent 1B Neftali Soto to a minor league contract. January 30, 2016 1B Neftali Soto assigned to Puerto Rico. November 6, 2015 1B Neftali Soto elected free agency. September 9, 2015 Charlotte Knights activated 1B Neftali Soto from the 7-day disabled list. June 14, 2015 Charlotte Knights placed 1B Neftali Soto on the 7-day disabled list. March 25, 2015 IF Neftali Soto assigned to Chicago White Sox. March 23, 2015 Cincinnati Reds traded 1B Neftali Soto to Chicago White Sox for cash. March 23, 2015 1B Neftali Soto assigned to Charlotte Knights. January 30, 2015 1B Neftali Soto assigned to Puerto Rico. December 17, 2014 1B Neftali Soto assigned to Pensacola Blue Wahoos. December 8, 2014 Cincinnati Reds signed free agent 1B Neftali Soto to a minor league contract and invited him to spring training. November 3, 2014 1B Neftali Soto elected free agency. October 30, 2014 1B Neftali Soto assigned to Cangrejeros de Santurce. October 30, 2014 Cangrejeros de Santurce activated 3B Neftali Soto. October 30, 2014 Cangrejeros de Santurce placed 1B Neftali Soto on the reserve list. October 28, 2014 Cincinnati Reds sent 1B Neftali Soto outright to Louisville Bats. September 29, 2014 Cincinnati Reds recalled 1B Neftali Soto from Louisville Bats. July 20, 2014 Cincinnati Reds optioned 1B Neftali Soto to Louisville Bats. July 12, 2014 Cincinnati Reds recalled Neftali Soto from Louisville Bats. May 23, 2014 Cincinnati Reds optioned 1B Neftali Soto to Louisville Bats. 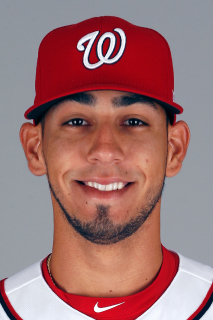 January 1, 2014 1B Neftali Soto assigned to Criollos de Caguas. November 1, 2013 1B Neftali Soto assigned to Cangrejeros de Santurce. October 2, 2013 Neftali Soto roster status changed by Cincinnati Reds. October 1, 2013 Cincinnati Reds reassigned 3B Neftali Soto to the minor leagues. September 2, 2013 Cincinnati Reds recalled 3B Neftali Soto from Louisville Bats. July 24, 2013 Cincinnati Reds optioned Neftali Soto to Louisville Bats. July 18, 2013 Cincinnati Reds recalled Neftali Soto from Louisville Bats. May 20, 2013 Cincinnati Reds optioned Neftali Soto to Louisville Bats. May 18, 2013 Cincinnati Reds recalled Neftali Soto from Louisville Bats. April 11, 2013 Neftali Soto roster status changed by Louisville Bats. April 4, 2013 Louisville Bats placed 1B Neftali Soto on the 7-day disabled list. March 16, 2013 Cincinnati Reds optioned 1B Neftali Soto to Louisville Bats. October 15, 2012 Neftali Soto roster status changed by Cincinnati Reds. October 15, 2012 1B Neftali Soto roster status changed by Louisville Bats. June 30, 2012 Louisville Bats activated 1B Neftali Soto from the 7-day disabled list. March 18, 2012 Cincinnati Reds optioned 1B Neftali Soto to Louisville Bats. November 18, 2011 Cincinnati Reds selected the contract of Neftali Soto from Louisville Bats. November 4, 2011 1B Neftali Soto assigned to Leones de Ponce. September 1, 2011 Neftali Soto assigned to Louisville Bats from Carolina Mudcats. May 21, 2011 Neftali Soto roster status changed by Carolina Mudcats. April 5, 2011 1B Neftali Soto assigned to Carolina Mudcats from Bakersfield Blaze. February 28, 2011 1B Neftali Soto assigned to Cincinnati Reds. March 21, 2010 3B Neftali Soto assigned to Cincinnati Reds. December 17, 2009 3B Neftali Soto assigned to Criollos de Caguas. November 10, 2009 1B Neftali Soto transferred to Lynchburg Hillcats from Sarasota Reds.